After Combat Stress, Violence Can Show Up At Home : Shots - Health News In a minority of cases, violent behavior accompanies post-traumatic stress disorder. Military spouses can become victims, and there are few resources around to help them. 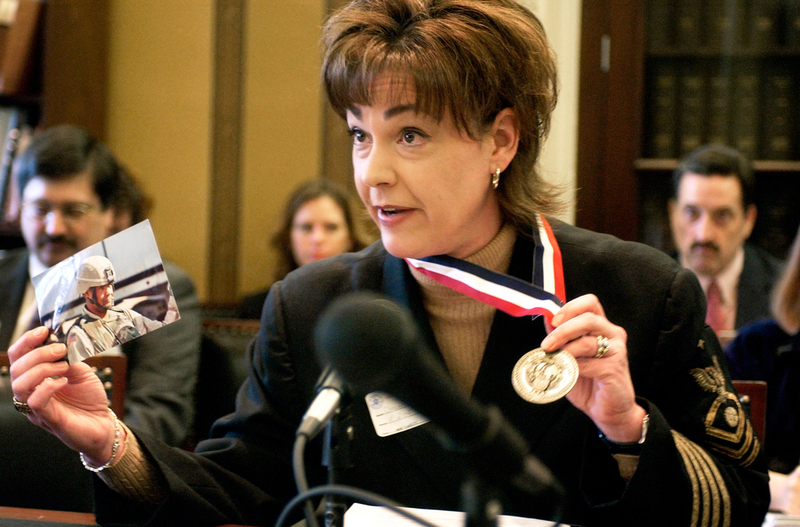 Stacy Bannerman testifies before the House Appropriations Subcommittee on Military Quality of Life and Veterans Affairs in 2006. At first, she thought it was just a problem within her marriage. She called a hotline for military families to ask for help and learned something else she hadn't expected. "The woman operating the hotline began weeping," Bannerman remembered. "She was getting so many of these calls from military spouses all over the country." The debate about the relationship between domestic violence and post-traumatic stress disorder has waxed and waned since the invasions of Iraq and Afghanistan, but has never quite gone away. Headlines periodically reignite it, as when the son of former Alaska Gov. Sarah Palin, who is an Iraq vet, faced domestic violence allegations earlier this year. Veterans' advocates are anxious about the stereotype of combat vets as ticking time bombs, which is contradicted by the vast majority of former troops who live with post-traumatic stress and never hurt anyone. There is a link, however, between PTSD and violence, said Dr. Casey Taft, a top researcher with the Department of Veterans Affairs. Vets with PTSD are three times more likely to be violent, he said. "When one is exposed to war-zone trauma and combat trauma, they are going to be more likely to assume the worst and assume people are trying to do harm to them — and more likely to respond to that with aggressions," he said. For many sufferers of post-traumatic stress, the terror and adrenaline of a life-threatening moment won't go away. When that builds into aggression, the target can often be a wife or girlfriend. More than a third of women and about a fourth of men surveyed in the U.S. have experienced "intimate partner violence" at some point in their lives, according to public health statistics. Studies commissioned by the VA suggest those levels are about the same among active-duty troops and veterans, but more such research is ongoing. Bannerman wrote a book about her experience, and says that today she hears from the partners of veterans almost every day. The stories tend to be similar. "He was shrieking with his eyes open. And I went to shake him. He grabbed my wrist and twisted it. ... I knew my wrist was broken," one woman told NPR. "I took myself to the emergency room." Another woman described how her husband shoved her down just after her son was born, ripping open the scar from her cesarean section. A third woman found that her husband would sometimes just "go blank," she said. "You could see that he wasn't there." The three women, all of whom are full-time caregivers to disabled combat veterans, talked with NPR about their experience after requesting that they not be identified in order to protect their privacy and allow them speak frankly. They described, among other things, the shock they felt at how different their husbands were after returning home from deployments. "It really took me by surprise," one said. "It was completely out of his character for the man that I met and fell in love with." The women described how, initially, they began covering for the men. The woman whose childbirth surgery scar was torn told doctors in the hospital's emergency department that she had tripped over their dog and fell. "I've never given the ER the correct info," said another woman about her many hospital visits. Victims of domestic violence have many reasons for staying in their relationships. In the military, there are more reasons: reporting abuse can end a soldier's career badly, which can mean not only disgrace but no benefits for the family. Some of the women who talked with NPR also said they thought that their husbands could get better with time and help. "I wanted to keep my family together," one said. "We had three kids at this time. I didn't want his career to be over because of this — if I could just get him the help that he needs." Serving as the caregiver for a wounded vet can be its own full-time job, with a stipend from the VA. For women in an abusive situation, leaving can also mean leaving behind that source of income. "He would still have his pay every month," as one wife told NPR. "He wouldn't have to worry financially. If I were to walk out? I walk out with nothing. No job. I haven't been working since 2012." All three of the women who spoke with NPR said they wanted to stay, to help their husbands recover from war. They went into their relationships with their eyes open, they said, and felt that caring for their sometimes violent husbands was its own form of service to the country. "I thought, 'This is my job,' " one said. "He went and did his job, and this is mine. That's a prevalent thought among the wives of wounded soldiers. I see it all the time." Most veterans with post-traumatic stress are not violent, but the VA is focused on researching those who are. One thing that's clear is that abusing drugs and alcohol makes the problems worse. Taft has set up a pilot program to try to help prevent domestic violence. One challenge, however, is that the VA is focused on veterans, not their wives. And veterans' groups don't talk much about domestic violence — and most domestic violence groups don't have expertise about veterans and post-traumatic stress. So even with the commitments and the patriotism that some wives express about riding out rough times with their families, the silence and the lack of support can still break a marriage. One of the women who talked with NPR eventually left her husband after an incident that she said forced her to have a new perspective about her family. "He had shoved me down. I looked up and all three of my kids were standing there in tears," the woman told NPR. "I thought, 'If a man ever treats one of my girls like this, or my son ends up like this, I will never forgive myself.' "
Her husband wasn't changing his behavior, she realized — "so I have to be the one who does something. I picked up the phone and I called the police. That was the first time I ever called them." Another woman interviewed for this story moved with her family to a different state, where her husband found better results with the local VA.
"He's come around," she said. "He's started to become more the man I met and fell in love with. There hasn't been any sort of physical altercation since 2014." The third woman who talked with NPR left her husband briefly but decided to go back. The problems returned, too, though. "I haven't regretted anything," she said. "Have there been really hard times since then? Yeah. Have I gotten the s*** kicked out of me since then? Yeah." The woman helps her husband, a Marine combat vet, get to his VA appointments on time. He has cut down on his drinking and attended a Christian retreat for veterans. Even so, there's no telling when something will come along that can create a potential crisis, as when the GPS navigation device in the car won't work. He hasn't hit her since last year, the woman said, when he smashed her face in the shower and choked her. It was over something the former Marine acknowledged was "something very stupid. A lot of these things, I can't remember what I was so pissed off about," he said. The couple was asked whether they felt they'd made it out of the woods. "No, not even close," the former Marine said. "And we never will be," his wife said. The woman acknowledged that people urge her to leave the relationship, but she told NPR that she is staying. She does not blame anyone else who leaves a situation like hers, she said, but she is staying with her husband. "He is not his post-traumatic stress disorder," she said. "He is not his brain injury. These are things he has gotten from serving his country. And that is what we deal with."